Conventional transbronchial needle aspiration (TBNA) is a safe technique and should be used to sample mediastinal and hilar lymphadenopathy during initial diagnostic bronchoscopy where a pre-procedure CT scan has demonstrated significant adenopathy. Conventional TBNA is a safe technique for sampling hilar and mediastinal lymph nodes in cases of suspected sarcoidosis and may be used in conjunction with endobronchial and transbronchial biopsies. Depending upon the clinical setting, a non-diagnostic conventional TBNA result may warrant further investigation. Real-time endobronchial ultrasound-guided TBNA (EBUS-TBNA) or surgical lymph node sampling should be considered. EBUS-TBNA is a safe and effective technique for the assessment of hilar and mediastinal lymph nodes in cases of confirmed or suspected lung cancer. EBUS-TBNA is a safe and effective technique for sampling hilar and mediastinal lymph nodes in cases of suspected sarcoidosis and may be used in conjunction with endobronchial and transbronchial biopsies. EBUS-TBNA is a safe and effective technique for sampling paratracheal and peribronchial intraparenchymal lung masses. At present there is insufficient evidence to recommend EBUS-TBNA for routine use in the diagnosis of lymphoma. In cases where EBUS-TBNA results are negative for malignancy, a confirmatory surgical biopsy should be performed where appropriate. In patients with central airway obstruction (CAO) due to intraluminal tumour, endobronchial tumour debulking should be considered. When undertaking endobronchial debulking of tumours, a laryngeal mask or uncuffed endotracheal tube is recommended to achieve airway control. Endobronchial electrocautery may be considered for use with curative intent in benign disease of the airway including incising web-like stenosis, benign tumours and granulation tissue. It may also be considered for primary treatment of early stage non-invasive lung cancer. Endobronchial electrocautery may be considered for palliation of malignant CAO, with or without critical airway narrowing. When undertaking snare resection, intermittent bursts of electrocautery of not more than 2 s duration should be used while carefully closing the snare until resistance is felt. Avoid an Fio2 of >0.4 when undertaking electrocautery to reduce the risk of airway fire. APC may be considered for the debulking of obstructing endobronchial tumour. APC may be considered for tumour debulking in patients without acute critical airway narrowing. APC may be considered for the treatment of haemoptysis in patients with endobronchial abnormalities. In patients with CAO due to intraluminal tumour, relief of obstruction using Nd-YAG laser may be considered. Cryobiopsy may be considered for diagnostic endobronchial tissue sampling to provide large-volume specimens without crush artefact. Cryotherapy may be considered for tumour debulking in patients without critical airway narrowing. Cryorecanalisation/cryoextraction may be considered for tumour debulking. PDT may be considered for tumour debulking in patients without critical airway narrowing. The technique should be available for carefully selected patients on a regional basis. Brachytherapy should not be used first-line in preference to external beam radiotherapy for the palliation of lung cancer. Brachytherapy should be considered for the palliation of haemoptysis or CAO in locally advanced central lung cancer. The use of self-expanding metallic stents may be considered for the treatment of malignant CAO due to extrinsic disease. Self-expanding metallic stents may be used to maintain airway patency following endobronchial debulking techniques. Self-expanding metallic stents can be used to restore or maintain airway patency in conjunction with other treatments such as external beam radiotherapy. Patients require careful specialist follow-up after stent insertion. Stents should be used with caution in non-malignant disease, considering their long-term complications. Self-expanding metallic stents may be difficult to remove following long-term placement. Self-expanding metallic stents should only be used in benign disease after all other therapeutic options have been exhausted. A risk-benefit assessment should be performed, incorporating immediate and long-term implications, prior to selecting any particular type of stent. Fractionated brachytherapy should also be considered for the curative treatment of early central lung cancer, especially if performance or cardiorespiratory status precludes surgery or radical external beam radiotherapy. The success of brachytherapy for radical treatments requires accurate local staging to exclude extrabronchial tumour extension. PDT can be considered for the curative treatment of early central lung cancer, especially for tumours 1 cm or less in diameter and provided there is no imaging evidence of extrabronchial involvement. PDT can be considered for the curative treatment of recurrent lung cancer where there is localised endobronchial disease in patients who are not fit for surgery or radical radiotherapy. Electromagnetic bronchoscopy may be considered for the biopsy of peripheral lesions or to guide TBNA for sampling mediastinal lymph nodes. Endobronchial valves may be considered in the treatment of selected patients with severe emphysema and hyperinflation with heterogeneous disease in the absence of significant collateral ventilation or who have a complete fissure on CT scanning. Patients should be enrolled into clinical trials until more robust data of clinical benefit is available. Bronchial thermoplasty is a possible treatment option in selected patients with severe persistent asthma already on maximal therapy, although its place in the treatment of asthma remains to be established. Long-term safety and efficacy remain unclear. Hence, treatment should be limited to a few specialist centres in carefully selected patients. Longer-term follow-up of treated patients is recommended. Interventional bronchoscopy has rapidly evolved in recent years. The field includes the use of more complex diagnostic procedures such as endobronchial ultrasound, the use of bronchoscopic interventions for the relief of central airway obstruction (CAO) due to malignancy and, more recently, the development of therapeutic interventions for non-malignant disease.1 Many practitioners may feel that this is a highly specialist field and that the techniques are experimental, only for tertiary centres. Perhaps they feel that they do not have the expertise to undertake these procedures. The fact is that some of these techniques such as transbronchial needle aspiration (TBNA) really should be part of every bronchoscopist's practice. Others such as endobronchial ultrasound (EBUS) are rapidly becoming standard practice and should be available to all patients, and some such as bronchial thermoplasty and airway valves are yet to establish their role in routine practice. There are also a large variety of methods of tumour debulking, and it is clearly not easy for a practitioner outside the field to know what are the indications, contraindications, potential benefits and complications of each technique, or which technique to consider learning. This guideline therefore aims to help all those who undertake flexible bronchoscopy to understand more about this important and rapidly developing area. In August 2007 the Standards of Care Committee of the British Thoracic Society (BTS) invited the Interventional Pulmonology Specialist Advisory Group of the BTS to produce an evidence-based update of the guideline on bronchoscopy and agreed this should now include interventional bronchoscopy. The Working Party decided to start with this new guideline on interventional bronchoscopy. This guideline is aimed primarily at practitioners within the UK but may be of relevance to other healthcare systems. It is intended to inform those who undertake or intend to undertake the procedures within the guideline, and also to inform others as to what may be available for patients under their care and the indications, likely response and complications of such procedures. Not all of the procedures may be available in all areas, including some tumour debulking procedures, but at least one of the tumour debulking modalities should be available in each cancer network. This guideline was formulated following consultation with stakeholders from the medical and nursing professions, patient groups and healthcare management. Advanced diagnostic and therapeutic procedures in adults using a flexible bronchoscope are included in the guideline. Rigid or flexible bronchoscopy for interventional procedures? This guideline covers interventional procedures performed using flexible bronchoscopy. In many units, however, rigid bronchoscopy alone would be used for such procedures. Most UK respiratory physicians lack training in rigid bronchoscopy, and most bronchoscopy units outside thoracic surgery centres do not have ready access to rigid bronchoscopy as a back-up for, or as an alternative to, flexible bronchoscopy. Most interventional procedures, however, can be undertaken via flexible or rigid bronchoscopy, including removal of many foreign bodies, metallic stent insertion and tumour debulking with diathermy, argon plasma, cryoextraction and photodynamic therapy (PDT). Although thermal lasers can be used with either scope, most practitioners of this technique prefer to use rigid bronchoscopy. Silicone and Y-stents are inserted via rigid bronchoscopy. This guideline is based on the best available evidence. The methodology used to write the guideline adheres strictly to the criteria as set by the AGREE collaboration in the document, which is available online http://www.agreecollaboration.org/1/agreeguide/. Clinical questions were gathered in the PICOT (Patient, Intervention, Control, Outcome and Time) format to define the scope of the guideline and inform the literature search. Systematic electronic database searches were conducted in order to identify potentially relevant studies for inclusion in the guideline. For each topic area the following databases were searched: Ovid MEDLINE (from 1988) (including MEDLINE In Process), Ovid EMBASE (from 1988), Ovid CINAHL (from 1982) and the Cochrane Library (from 1992) (including the Cochrane Database of Systematic Reviews, the Database of Abstracts of Reviews of Effects, the Cochrane Central Register of Controlled Trials, the Health Technology Assessment database and the NHS Economic Evaluation Database). The searches were first run in January 2008 and updated in September 2010. Searches were saved and run on a monthly basis to identify newly published literature to date. Searches included a combination of indexed terms and free text terms and were limited to English language publications only. The initial search identified 3751 potential papers. Whether the study addressed the clinical question. Whether the appropriate study type was used to produce the best evidence to answer the clinical question. Studies where exclusively rigid bronchoscopy was used were not evaluated. Abstracts were not rejected on the basis of the journal of publication, country in which the research was performed or published nor the date of publication. The full paper was obtained for all relevant or possibly relevant abstracts and allocated to the relevant section(s) which were broadly grouped as argon plasma, brachytherapy, cryotherapy, diathermy, EBUS, TBNA, endobronchial valves, general interventional bronchoscopy, laser, photodynamic therapy, stents, thermoplasty and virtual bronchoscopy with electromagnetic navigation. The first screening process identified 1022 of the initial 3751 reference abstracts to be definitely or possibly relevant to the guideline. Two guideline reviewers independently reviewed the abstracts to identify papers to be appraised for the guideline. Three hundred and eighty-seven papers were critically appraised. The two leads for each section independently appraised each paper assigned to them using the Scottish Intercollegiate Guidelines Network (SIGN) critical appraisal checklists. A web-based guideline development tool (http://www.bronchoscopy-guideline.org) enabled each pair of reviewers to collaborate online. The reliability of the evidence in each individual study was graded using the SIGN critical appraisal check lists and is shown in the evidence tables (++, + or −). The body of evidence for each recommendation was summarised into evidence statements and graded using the SIGN grading system (see table 1). Disagreements were resolved by discussion with the section partner. The available volume of the body evidence. Whether the evidence was generalisible to the target population for the guideline. What the implications of recommendations will be on clinical practice in terms of resources and skilled expertise. Cost-effectiveness was not reviewed in detail as in-depth economic analysis of recommendations fall beyond the scope of this guideline. Recommendations were graded from A to D as indicated by the strength of the evidence as shown in table 2. Important practical points lacking any research evidence were highlighted as ‘Good Practice Points’ (GPP). The Guideline Committee corresponded regularly by email and meetings of the full group were held in December 2007, June 2008, December 2008, March 2009, June 2009 and October 2009. The guideline was discussed at an open session at the BTS Winter Conference in December 2009. A revised draft guideline document was circulated to all the relevant stakeholders for consultation in May 2010 followed by a period of online consultation. The BTS Standards of Care Committee reviewed the draft guideline in July 2010. Further revision was made in September 2010 following the incorporation of suggestions by international experts in interventional bronchoscopy. The guideline was reviewed by the BTS Standards of Care Committee in November 2010 and submitted for publication. The Guideline Group members adhered to the BTS policy for the Declaration of Interests and, where appropriate, specific interests are declared in Appendix 1. The guideline will be reviewed and updated in 2015. All those undertaking any interventional procedure are advised to maintain records of each procedure including indication, outcome and complications for audit purposes. It is recommended that a database should be kept of all those in the UK undertaking interventional procedures and numbers being treated. The database should include details of current training in interventional procedures available in the UK. A randomised controlled trial (RCT) comparing symptom relief and survival in patients with malignant CAO receiving airway intervention in combination with conventional anticancer therapy versus conventional anticancer therapy alone. An RCT comparing EBUS with surgical staging of the mediastinum in lung cancer. An RCT comparing EBUS-TBNA with standard bronchoscopic techniques for the diagnosis of sarcoidosis. An RCT comparing outcomes including quality of life of treatment by debulking for CAO followed by conventional anticancer treatment with anticancer treatment alone. Defining the population or phenotype of disease that benefits from the bronchoscopic lung volume reduction techniques available. Further RCTs on the techniques available for bronchoscopic lung volume reduction with improved patient selection. Longer-term evaluation of safety and efficacy of bronchial thermoplasty. Recommended standards of care based on the recommendations in this guideline can be found on the BTS website at: http://www.brit-thoracic.org.uk/. It is clear from a survey of respiratory trainees in the UK that, by the final year of training, few consider themselves to be competent to undertake interventional diagnostic or therapeutic procedures; 36% felt competent to undertake simple TBNA but only 2.8% felt competent to undertake EBUS-TBNA or endobronchial diathermy.2 To be competent in any specialised technique it is useful to have attended a course and undertaken the procedure on a model, but it is also necessary to have received experience in a centre undertaking the procedure and also to have hands-on experience. Evidence on training requirements is sparse. There are published recommendations for training by the American College of Chest Physicians3 and also in the ERS/ATS statement on interventional pulmonology.4 The Guideline Group has decided not to quote specific numbers of procedures required to be performed before an individual is deemed competent as these numbers are usually arbitrary. Individuals have different learning curves and hence focus should be towards monitoring an individual's performance and outcomes.5 Standards for particular procedures need to be determined and agreed. These can then be used for outcome-based assessment of competency. Transbronchial lymph node sampling can be used both for diagnosis and for staging of lung cancer and can be performed at initial diagnostic bronchoscopy. TBNA entails inserting a fine (usually 19–22 gauge) needle through the wall of the airway into a lymph node in order to obtain a specimen for cytological, histological or microbiological analysis. The technique can also be used to sample parenchymal lung masses that lie adjacent to the trachea or major airways. The procedure can be performed with or without the use of ultrasound guidance. In conventional TBNA a needle is passed through the working channel of a standard bronchoscope to puncture the airway wall at the site of the target lymph node or lung mass, whose position is determined from study of a pre-procedure CT. Virtual bronchoscopy using CT reconstructions has recently been described and can be used to help identify suitable positions for TBNA. 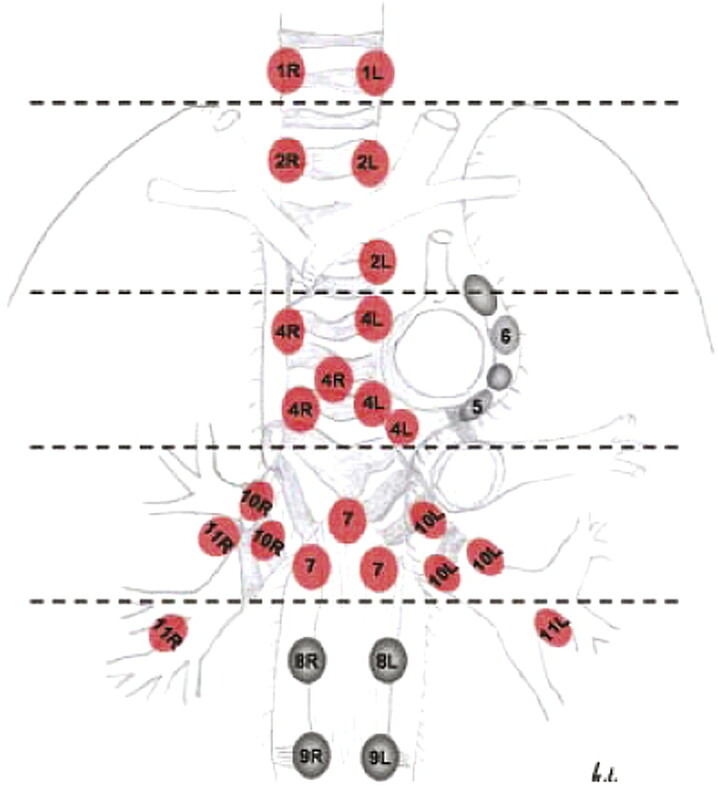 Lymph nodes stations that can be accessed in this way are 2R, 2L, 3P, 4R, 4L, 7, 10R, 10L, 11R and 11L (figure 1). Lymph node stations accessible by transbronchial fine needle aspiration (TBNA) are shown in red. Precise localisation of lymph nodes for TBNA may be assisted by real-time endobronchial ultrasound guidance. Nodes that cannot be sampled by TBNA are shown in dark grey. The dotted lines indicate anatomical borders that are important for identification of the different lymph node stations using endobronchial ultrasound. Station 3a/p nodes are not indicated on this image. Stations 5 and 6 nodes may be seen during endobronchial ultrasound but sampling is usually not possible due to the interposition of the great vessels. Figure reproduced from Tournoy et al6 with permission of the publishers. Ultrasound guidance may be used to locate lymph nodes for TBNA. In early descriptions a radial ultrasound miniprobe introduced through the working channel of a conventional bronchoscope was used to locate lymph nodes. The miniprobe was then removed and a TBNA needle was introduced to puncture the node at the predetermined position. This technique did not allow for real-time ultrasound visualisation of the TBNA. More recently, real-time EBUS-TBNA has been described which involves use of a convex array linear ultrasound bronchoscope. The use of real-time ultrasound imaging during TBNA allows specific nodes to be targeted and permits accurate biopsy of multiple lymph node stations when necessary for staging. Lymph nodes as small as 4 mm in the short axis have been sampled. The technique of TBNA is simple. Diagnostic yield is dependent upon operator experience, the position and the size of the lymph node. The use of rapid on-site cytopathology improves yield. A guide on how to perform TBNA is available in Appendix 2. TBNA is mainly used to sample hilar and mediastinal lymph nodes. It can also be used to sample paratracheal and peribronchial lung masses. Conventional (non-ultrasound-guided) TBNA is safe with few reported complications. In a meta-analysis by Holty et al the pooled complication rate was 0.3%.7 The complications most commonly reported are pneumomediastinum and pneumothorax, minor and self-limiting bleeding and puncture of adjacent structures. Two studies have demonstrated that 5–7 aspirates per node are required before a plateau in diagnostic accuracy is achieved.9 10 The success rate is highest in lymph nodes >20 mm in the short axis7 and in the station 4R and 7 lymph node locations (figure 1). The role of TBNA in the diagnosis of sarcoidosis has been reported.11 12 Considering TBNA alone, the diagnostic yield in stage I disease (61–82%) was higher than in stage II (42–75%). However, most operators use TBNA in this setting in conjunction with endobronchial and transbronchial biopsies and diagnostic yields of around 90% are achievable in stage I and II disease. EBUS-TBNA provides images of the mediastinal structures immediately surrounding the tracheobronchial tree. EBUS-TBNA is mainly used to sample hilar and mediastinal lymph nodes. It can also be used to sample paratracheal and peribronchial lung masses. In 2009, two meta-analyses and one systematic review reported the sensitivity and specificity of EBUS-TBNA. Adams et al and Gu et al reported that the pooled sensitivity for EBUS-TBNA was 88% (95% CI 70% to 94%) and 0.93 (95% CI 91 to 944), respectively.14 15 In their systematic review Varela-Lema et al reported that sensitivity for the diagnosis of malignancy ranged from 85% to 100%.16 In all three reports the specificity was 100%, but this figure is artificial as positive TBNA results were not confirmed by surgical resection. It should be noted, however, that many of the published case series upon which the systematic reviews are based come from a relatively small group of investigators and further experience is needed to see if these results can be widely replicated. Although in case series the reported sensitivity for the detection of malignancy in mediastinal lymph nodes is similar to that of mediastinoscopy,17 there are no reported prospective studies comparing the accuracy of EBUS-TBNA and mediastinoscopy for staging of lung cancer. One US-based study has reported the use of EBUS-TBNA in the diagnosis of lymphoma. In a retrospective review of 25 patients who underwent EBUS-TBNA for suspected lymphoma, 10 of 11 patients with a final diagnosis of lymphoma were correctly identified, giving a sensitivity of 90.9% and a specificity of 100%.20 Despite these impressive results, the applicability of EBUS-TBNA for the diagnosis of lymphoma in the UK is unclear, given that histopathology is often required for the final diagnosis. Four studies have assessed the clinical usefulness of EBUS-TBNA in the diagnosis of sarcoidosis. In these case series EBUS-TBNA was diagnostic in 88–93% of patients. However, it should be noted that the pre-test probability of a final diagnosis of sarcoidosis in these series was high.21–24 At present there is no evidence to indicate that EBUS-TBNA sampling of lymph nodes is any more or less effective for identifying non-caseating granulomas than transbronchial/endobronchial lung biopsies combined with bronchoalveolar lavage. A clinical trial addressing this issue is currently underway (http://Clinicaltrials.gov/ NCT00872612). At present some operators combine transbronchial biopsies and EBUS-TBNA lymph node sampling during a single procedure. Most new diagnoses of lung cancer are made at an advanced disease stage with 50% of patients having involvement of the central airways either due to endobronchial disease, extrinsic compression or both.13 Endotracheal or endobronchial obstruction by malignant disease may lead to cough, breathlessness and obstructive pneumonia. Endobronchial therapy may result in improvement of symptoms and quality of life. There are a number of treatment options available for relieving such symptoms including external beam radiotherapy. However, endobronchial debulking of tumours using rigid and flexible bronchoscopy is commonly used in some centres, especially when such techniques are readily available. There is a need to know the frequency of use of the various debulking techniques, and for more studies to compare the response to other forms of symptom palliation including external beam radiotherapy. Rigid bronchoscopic procedures under general anaesthesia combine the ability to maintain adequate ventilation, to remove large volume tumour and safely control large volume haemorrhage, but the widespread availability of, and increasing experience in, flexible bronchoscopy has led to an increasing use of flexible bronchoscopic procedures for debulking. Some of these procedures offer immediate relief of symptoms and in others the benefit is delayed. Where there is extrinsic compression of the airway, insertion of a stent may be more appropriate. When these procedures are performed, there should be adequate airway control since they carry significant risks of haemorrhage, respiratory failure and cardiac arrhythmias.25 A secure airway such as an endotracheal tube or laryngeal mask should be considered since this allows rapid and repeated insertion of the bronchoscope, high volume suction and the deployment of a balloon bronchial blocker. An example of a malignant airway obstruction flow diagram is shown in Appendix 3. Electrocautery (also known as diathermy) uses high-frequency electric current to cause heating which leads to coagulation at lower temperatures or tissue vaporisation at higher temperatures. The current is delivered endobronchially via a probe, snare or needle knife. The degree of tissue destruction depends on the power used, the duration and surface area of contact, and the density and moisture content of the tissue.26 A monopolar technique is used in the airways. The current passes from the applicator device, through the body to a return electrode usually applied to a limb. Low voltage, low power and high current settings will cause coagulation, while high voltage and low current will cause carbonisation (‘cutting’). Most electrocautery devices used via the bronchoscope use a blend of cut and coagulation waveforms. The equipment required for electrocautery is a high-frequency electrocautery generator and a selection of devices for endobronchial application. These may include a wire snare, probe, needle knife and ‘hot’ or punch biopsy forceps. The passage of an uncuffed endotracheal tube over the flexible bronchoscope at the beginning of the procedure can facilitate repeated removal of resected tissue. The initial energy setting (around 20 W) should be tested on normal mucosa before treating the lesion. Duration of treatment will affect the depth of tissue damage. Van Boxem et al showed that, at a power setting of 30 W, the depth of tissue necrosis increased with duration of application, from 0.1 mm after 1 s progressively to 1.9 mm after 5 s.27 Longer duration of coagulation (3–5 s) caused damage to underlying cartilage. It is necessary to continuously remove mucus, debris and blood to avoid current leakage. The probe may be used to vaporise superficial tumours. The snare is useful for debulking large volumes, especially of polypoid tumours. It may be necessary to take a number of separate sections of tumour before the airway is opened up. Removal of large volume tumour from the airway can be achieved in a variety of ways including suction, grasping or biopsy forceps, or use of a cryoprobe. The knife is particularly useful for resecting benign webs. Careful application of the patient plate and the use of insulated bronchoscopes reduce the risk of current leakage causing burns. Use in patients with pacemakers should be avoided if possible but, if use is unavoidable, guidelines for reducing risk are available from the Medicines and Healthcare products Regulatory Agency (MHRA).34 It is recommended that the skin surface overlying a metallic joint prosthesis be avoided when placing return electrodes for electrocautery. The evidence for palliation of airway obstruction from both primary and metastatic lung tumour comes from case series alone.29–31 33 35–38 The results are consistent, with successful outcomes in 39/56 patients,35 27/32 patients36 and 35/37 patients.33 A safety study undertaken by Horinouchi et al33 concluded that electrocautery is a safe and reliable procedure when used according to strict guidelines, which include a power output not exceeding 30 W for punch biopsy and snare resection, 20 W for probe, and 10 W for needle knife. To prevent airway fire the authors allowed supplemental oxygen only when electrical current was not being applied. The technique requires a suitable high-frequency current generator, a source of argon, a return electrode and a flexible delivery catheter containing a monopolar treatment electrode. The treatment catheter is made from a Teflon tube, typically of 1.5 mm or 2.3 mm in diameter, which contains a thin wire. The wire conducts the high-frequency current to the tip of the catheter where it ends in a tungsten electrode. The computer-controlled high-frequency generator sends high-voltage high-frequency current to the electrode, while argon is delivered along the catheter at a flow rate of 0.3–2.0 l/min. Argon plasma is produced at the tip and emerges from the catheter as a ‘spray’ of coagulating current, which seeks the path of least electrical resistance to the return electrode through the patient. It is recommended that the skin surface overlying a metallic joint prosthesis be avoided when placing return electrodes for APC. As the current passes through the bronchial mucosa, resistance within the tissue leads to heating, coagulation and desiccation. Increasing electrical resistance in the coagulated tissue in turn limits current flow and therefore the depth of coagulation, which is about 2 mm after a 2 s application. This self-limiting effect of APC is a useful feature for endobronchial application, reducing the risk of bronchial perforation. The treatment of haemoptysis caused by lesions within the central airways. Debulking of exophytic endobronchial tumours, both benign and malignant. Debulking of granulation tissue arising as a complication of tracheobronchial stent insertion. The published studies of APC do not permit the identification of patients most likely, on clinical or radiological grounds, to benefit from the procedure. In common with other ablation procedures performed using flexible bronchoscopy, APC should not normally be used for the treatment of lesions causing significant tracheal obstruction unless facilities are immediately available for securing the airway in the event of complications. Such lesions can more safely be treated by flexible bronchoscopy under general anaesthesia with endotracheal intubation or by rigid bronchoscopy. As with laser or electrocautery, APC is contraindicated where there is a requirement for a Fio2 of >0.4 because of the theoretical risk of endobronchial fire, although this complication has not been described in the literature. Most modern implantable cardiac pacemakers or defibrillators are compatible with diathermy/APC, but advice should be sought from the patient's cardiologist prior to the procedure. No procedure-related complications were described in the studies of Morice et al, Crosta et al and Okada et al.39 41 42 One patient died within 48 h of the procedure but this was ascribed to neutropenic sepsis. In the study by Reichle et al, 5/364 patients (1.4%) developed bronchial or tracheal perforations, all of which resolved on treatment.40 Three patients developed temporary post-procedural neurological complications and two patients died (myocardial infarction, hypovolaemic shock). The neurological and cardiac complications in these five patients may have been caused by intracardiac gas embolism. This has also been described by Reddy et al44 who reported three cases of intracardiac gas embolism (two fatal) occurring after APC over a period of 3 years, an estimated incidence of 1.3–2%. All were treated using rigid bronchoscopy and it is not clear whether gas embolism arose as a complication of APC or of jet ventilation. The overall incidence of significant complications appears therefore to be approximately 2%. The use of APC to treat CAO or haemoptysis using flexible bronchoscopy was examined in four retrospective case series involving 123 patients.39 41–43 In a much larger retrospective analysis of 364 prospectively collected cases,40 rigid bronchoscopy was used in more than 90%, but a flexible bronchoscope was passed through the rigid bronchoscope to deliver the treatment. The studies used different outcome measures for relief of CAO, retrospectively specified in all except the study by Reichle et al.40 The outcome measure used for haemoptysis was consistent—namely, non-recurrence during follow-up. In treating CAO, APC consistently improved symptoms and airway patency in all studies. In the only study with predefined outcomes, APC produced complete or partial success in reopening the treated airway in two-thirds of patients (124/186).40 The treatment of haemoptysis was described as being completely successful in 149/150 patients. The evidence is from case series alone but the outcomes are consistent. Laser therapy for the relief of endobronchial obstruction was first described in 1974 using the CO2 laser. The majority of publications report use of the Nd-YAG laser. In laser therapy the heat energy from laser light is used to coagulate and vaporise endobronchial tissue. The technique can be delivered via rigid or flexible bronchoscopy. Low-power laser is used initially to coagulate tissue to reduce the risk of bleeding. The laser fibre tip should be at least 3 mm from the target tissue to avoid the tissue being vaporised. Continuous suction is used during the procedure to remove smoke from the airways, and continuous inspection of non-obstructed airways is performed to remove any debris and to optimise ventilation. Inspired oxygen is limited to 40% to reduce the risk of airway fire. Laser exposure should be kept to a minimum. The main indication for laser therapy is the immediate relief of endobronchial obstruction due to primary lung cancer or metastatic disease. Data are almost entirely from case series45 50–53 and, although outcome data in many of these series are poorly documented, laser therapy appears to be effective in providing rapid relief of endobronchial obstruction with symptomatic improvement in around 70–80%.47 48 54 One-year survival following treatment was around 30%.45 46 There is some evidence that outcomes are better if the airway is not totally occluded prior to treatment. Laser therapy has no role in airway occlusion due to extrinsic compression. Cryotherapy uses extreme cold to cause delayed local destruction of tissue. It is applied in cycles of freezing and thawing, causing tissue necrosis. Cryotherapy is currently used in two different ways. Standard cryotherapy uses a cryoprobe inserted through the instrument channel of a bronchoscope and applied directly to the target tissue. The tissue is frozen and then allowed to thaw, and repeated freeze-thaw cycles lead to tissue necrosis. One disadvantage of standard cryotherapy is the need to repeat bronchoscopy 3–7 days later to remove necrotic material. A newer form of cryotherapy, ‘cryoextraction’, is performed with probes which have an improved join between gas channel and probe in order to withstand much greater forces. The probe is applied to the tissue and the freeze cycle activated for 3–7 s (depending on the tissue composition). The bronchoscope is then removed with the cryoprobe and attached tumour tissue. The tissue is allowed to thaw once it is removed from the airway. This technique is undertaken using an endotracheal airway to facilitate repeated removal and reinsertion of the bronchoscope. Cryotherapy—and, in particular, cryoextraction—is mainly indicated as a palliative measure in malignant airway obstruction. Cryoextraction can also be effectively applied to remove foreign objects and blood clots from the airways. There may be an indication for the treatment of low-grade malignant lesions such as adenoid cystic carcinoma and early cancer such as carcinoma in situ.4 The quality of specimens obtained using cryoextraction with absence of crush artefact has led to its use for endobronchial and transbronchial lung biopsy. Cryotherapy appears to be safe in the treatment of malignant endobronchial obstruction. In case series,57–63 the complications observed were haemoptysis (4–10%), bronchospasm (4.5%), cardiac arrhythmia (11%) and death (1.3%). In the largest case series comprising 521 patients, cryotherapy appeared effective in the treatment of malignant endobronchial obstruction.58 Technical success as judged by restoration of airway patency was 61% and improvement occurred in symptoms such as haemoptysis (61–76.4%), cough (69%) and dyspnoea (59–81%). One- and two-year survivals were 38.4% and 15.9%, respectively.58 Another series of 225 patients showed airway patency restoration (complete or partial) in 91%.65 A lot of the evidence base is from one centre which performed the procedure with a combination of rigid bronchoscopy and a flexible bronchoscope. The reviewers felt it was still important evidence that could be included in this guideline for flexible bronchoscopy, particularly as the technique can just as easily be performed by flexible bronchoscopy. Since cyroextraction produces immediate results (unlike conventional cryotherapy), it may be used for the management of acute tracheal or bronchial obstruction.64–66 Eighty-five per cent of patients with endobronchial stenosis could be treated with immediate response. Application of this technique is possible at the lobar or segmental level. PDT uses a systemic photosensitiser, most commonly a haematoporphyrin derivative, selectively retained and concentrated in tumour tissue to render the tumour sensitive to light of a given wavelength. The sensitised tumour is then illuminated by laser light of that wavelength, usually 630 Nm at the red end of the spectrum. In the presence of sensitiser and oxygen, laser light illumination causes tumour cell death by a complex pathway triggered by the release of singlet oxygen. PDT requires a photosensitiser, a diode laser and a flexible light-guide, at the end of which is either a radial diffuser or a forward-projecting microlens. The photosensitiser most often used has been intravenous porfimer sodium administered in a dose of 200 mg/kg. The laser with its calibration device is a compact desktop instrument. Forty-eight hours after the administration of photosensitiser the tumour is illuminated by laser light using a flexible light-guide passed down the working channel of a standard flexible bronchoscope. The use of PDT lasers requires standard laser safety precautions, principally to address the risk of ocular damage. There are no thermal risks. Early central lung cancer, defined as visible endoscopically but not on imaging. The palliative treatment of malignancy causing endobronchial large airway obstruction. Hematoporphyrin derivatives are taken up by skin, causing sensitivity to sunlight or bright direct light for up to 8 weeks. Protection of exposed areas is necessary, but indoor light is safe and some light exposure is required to photobleach the sensitiser from the skin. In one series of nine patients there was one massive haemoptysis and one bronchopleural fistula.68 Complications may arise from delayed necrosis of treated tissue. PDT requires the purchase or loan of a diode laser. Intravenous PDT sensitisers are expensive. Light-guides are reusable, being deployed inside a disposable plastic sheath. In the treatment of early central lung cancer, complete responses have been reported in 30–100% of patients and at least 80% in most series.69–71 Around a third of patients have required two treatments and a few have needed three treatments. Partial responders can be considered for other treatments including resection or radiotherapy if appropriate. Better responses have been reported for tumours 1 cm or less in diameter. Overall 5-year survival rates have been around 50%, cancer-specific survival up to 90%. There are only a few series reporting the effect of PDT in palliating the endobronchial symptoms of advanced lung cancer, but it has been shown to be effective for palliation before or after other treatments. Moghissi et al reported experience of 100 cases, 82% of whom had been pretreated.72 Mean endoluminal obstruction (estimated bronchoscopically) fell from 86% to 17.5% with significant increases in forced expiratory volume in 1 s (FEV1). All patients had symptomatic relief and 20% had a complete endoscopic response for 3–19 months. There was no treatment-related mortality in this series. In a review of 12 papers comprising 636 patients with advanced lung cancer, almost all patients had some relief in cough and dyspnoea.73 Comparisons with YAG laser treatment suggests more prolonged symptomatic relief with PDT,74 but it has also been used in combination with YAG laser and with endobronchial radiotherapy, with some evidence of a better response to combined treatments. The word derives from the Greek ‘Brachis’ meaning ‘close to’. It refers to the placement of radioactive sources within or alongside tumours, enabling an effective local dose to be administered but sparing surrounding tissues from the effects of radiation. The use of brachytherapy for lung tumours has been made possible by the development of high dose rate sources enabling treatment to be administered in minutes rather than hours. The technique is suitable for the relief of large airway obstruction and the relief of haemoptysis and other symptoms caused by endobronchial tumour. It can also be used with curative intent for tumours which are small enough to be encompassed by the limited field of radiation. The technique is suitable for the primary and secondary palliation of symptoms caused by large airway obstruction including cough, shortness of breath, haemoptysis and obstructive collapse. It is effective for the treatment of endobronchial tumour and submucosal/peribronchial infiltration. It is not suitable for the treatment of extrinsic compression. It offers flexibility in a number of situations such as bilateral or multiple tumours, or in patients who have been pre-treated with other techniques including external beam radiotherapy. It may be considered for the attempted cure of early central lung cancer subject to accurate local staging to confirm that there has not been extrabronchial spread of tumour. Some patients develop radiation bronchitis and occasionally stenosis. The principal serious risk is of massive haemoptysis, often occurring as a late complication in good responders, and more likely to occur with a higher local radiation dosage—that is, in patients who have also received external beam radiation either sequentially or concurrently. The equipment is expensive to purchase but can also be used to treat other organ sites and is usually available in major radiotherapy centres. It requires the availability of flexible bronchoscopy, preferably within the radiotherapy treatment area, and needs good collaboration between physician/endoscopist and clinical oncologist. Health economics comparisons are not straightforward, but it compares favourably with multifraction external beam treatments in terms of cost and patient convenience and avoids the side effects of external beam radiation, especially oesophagitis. It should be available to cancer networks as a treatment option for selected patients. No survival benefit has been demonstrated for palliative treatments. Survival has been related, unsurprisingly, to performance status. Brachytherapy has been used to treat radiologically-occult early-stage lung cancer.75 84 Complete endoscopic responses have been reported in 65–90% of patients, with partial responses in the remainder and 5-year survival of around 80%. Flexible bronchoscopy is an alternative to rigid bronchoscopy to deploy metallic airway stents. The current standard is the Self-Expanding Metallic Airway Stent (SEMAS), made from the alloy NITINOL (Nickel Titanium National Ordnance Laboratories). SEMAS are used to treat airway stenosis or aerodigestive fistulae due to malignant disease. Their use is not advised in benign disease because of the high incidence of severe complications with prolonged use. Before embarking upon a stenting procedure, a stent of the correct diameter, length and type must be chosen. The availability of modern multislice CT scans with multiplanar reformats has considerably facilitated this process, making it possible accurately to estimate the length and minimum diameter of the luminal stenosis and the diameter of the adjacent normal lumen. Where a main bronchus is extensively narrowed, the opposite main bronchus can be used to estimate the premorbid airway diameter. The length of the stent should be chosen to provide at least 0.5–1.0 cm of overlap at each end of the stenosed segment where possible. The diameter of the stent should be 1–2 mm greater than the estimated normal diameter of the airway. Stent sizing is usually 12–14 mm in diameter for main bronchi, 18–20 mm for the trachea, with lengths of 40 mm for the left main bronchus, 30–40 mm for the right main bronchus and 60–80 mm for the trachea. Where the lesion is exclusively extrabronchial, an uncovered stent is favoured because ventilation of side-branching bronchi can be maintained. For lesions with both extrinsic compression and endobronchial tumour, a stent incorporating a covering membrane (‘covered stent’) is favoured to prevent tumour in growth through the stent after deployment. A selection of stent sizes should be available prior to the procedure in case bronchoscopic inspection leads to a change of chosen stent size. Some operators favour the insertion of an uncuffed endotracheal tube over the bronchoscope to protect the airway during the procedure. This may reduce trauma to the vocal cords from repeated bronchoscopic intubation and withdrawal during the procedure. After airway inspection a guidewire is introduced through the working channel of the bronchoscope and positioned beyond the distal extent of the lesion. The bronchoscope is then withdrawn leaving the guidewire in place. The bronchoscope is reintroduced next to the guidewire. The stent is placed over the guidewire and introduced. The distal end of the stent is advanced beyond the stenosed airway segment. The precise positioning of the proximal and distal ends of the stent can be checked either bronchoscopically or fluoroscopically. When these are satisfactory, the stent can be deployed. A number of stent deployment devices are available. These all have the stent held compressed radially onto a delivery catheter and held down by a restraining mechanism which may be a silk thread or an external catheter. More recently, metallic carinal Y-stents have become available whose deployment is complex and better performed during rigid bronchoscopy. SEMAS are used principally for the relief of CAO due to malignant disease. Other indications include malignant airway fistulas and post-anastomosis bronchial strictures following lung transplantation. The expertise to deliver airway stenting should exist within each cancer network. It may be provided by thoracic surgeons or respiratory physicians, but should form part of multimodality treatment supervised by a properly constituted cancer multidisciplinary team. It is essential that the team performing the procedures should have appropriate expertise in managing airway complications, should they occur. Safe airway stenting requires the presence of at least two experienced practitioners, one to visualise the endobronchial appearances and one to deploy the stent. The use of self-expanding metallic stents for the treatment of CAO is associated with a number of complications including stent malposition, migration or fracture, haemorrhage, mucus impaction, overgrowth by granulation tissue or tumour, infection, aerodigestive fistula formation and bronchospasm. Early stent-associated deaths have been reported due to complications such as hypoxia following stent migration, severe sepsis89 and bronchospasm.90 Complications may necessitate stent removal, which can be complex and hazardous where there has been a stent fracture. In benign airway conditions where life expectancy is greater, metallic stents are not recommended because of the longer-term risk of stent fracture. In CAO due to benign causes, stents improve symptoms. In a series of 40 patients this improvement was evident in stridor in 73% of cases, breathlessness in 71%, cough in 79% and in sputum clearance in 75%.91 In five series where a proportion of patients had lung function assessed before and after stent insertion,89 91–94 FEV1, forced vital capacity (FVC) and airway resistance (where measured) improved. In patients with acute respiratory failure due to malignant CAO requiring mechanical ventilation, stenting is associated with weaning from ventilatory support. In one series this was achieved in 14 of 26 patients with CAO, 21 of whom had malignancy.95 96 These case series data do not permit the identification of stenting as the cause of weaning success. RCTs are needed to compare the addition of airway stenting to conventional anticancer treatments versus conventional treatment alone in patients with CAO due to malignancy. The following applications have been developed for use with the flexible bronchoscope but are yet to have established a clear place in routine practice. ENB is an image-guided localisation system to aid biopsy of lesions that are not visible endobronchially. It combines CT-generated virtual bronchoscopy and electromagnetic tracking of a steerable probe within the bronchial tree. A multi-slice thin-section CT scan of the thorax is performed and used to create a 3-D virtual bronchoscopy. During virtual bronchoscopy, specific bronchial landmarks such as the main and segmental carinae are identified and the target lesion is marked. At bronchoscopy the patient lies in a magnetic field created by an electromagnetic board placed below the chest. A magnetic locatable probe, passed through the bronchoscope, is used to mark the same sites in the bronchial tree as were previously identified on virtual bronchoscopy. The two sets of data are then merged to co-register the CT data on the bronchoscopic spatial points. This allows the data from the virtual bronchoscopy to direct the bronchoscopic probe to the lesion. Once the desired location is reached, the locatable guide is exchanged for biopsy forceps or bronchial brushes and sampling is performed. ENB appears to be safe, with pneumothorax as the most commonly reported complication. The rates of pneumothorax reported in three studies using ENB were 3.5–7.5%,97–99 which are lower than reported rates of pneumothorax following CT-guided percutaneous needle biopsy.100–102 However, RCTs comparing the techniques have not been performed. The evidence comes from six case series97–99 103–105 with a total of 231 patients. In these studies a diagnostic rate of 59–80% was achieved. The results indicate that diagnostic accuracy is related to the size of the pulmonary opacity, with greater accuracy for masses >40 mm in diameter. Studies using virtual bronchoscopy alone to guide peripheral lung biopsy have found similar diagnostic rates,108–110 and there is currently a lack of evidence that ENB provides additional sensitivity. ENB appears to be a safe and effective but expensive modality for the sampling of peripheral lung lesions. Patients with severe emphysema who are on maximal medical treatment are often very disabled. Treatment options other than lung transplantation and, in selected cases, lung volume reduction surgery are limited. This group of patients has significant morbidity with repeated hospitalisations and increased healthcare utilisation. In the UK over 20% of patients with emphysema have severe disease, and in 2004 chronic obstructive pulmonary disease accounted for 1.4 million consultations with over 100 000 hospital admissions. Endobronchial valves may be used in the treatment of patients with emphysema with severe hyperinflation. The valves are inserted into the target area of the lungs via flexible bronchoscopy under conscious sedation or general anaesthesia. Two different valves systems are available. The Zephyr valve is a one-way duck-billed valve and the intrabronchial valve (IBV) is an umbrella-like device. Both valves act by reducing gas inflow to the treated segment while allowing air and secretions to exit. The procedure may be performed under conscious sedation or general anaesthesia. The insertion of an endotracheal tube at the beginning of the procedure is recommended. Under direct vision the size of the target airway is estimated. For the Zephyr valve, an appropriately-sized device on its catheter is inserted through the instrument channel of the bronchoscope and the valve is partly deployed. The valve is then wedged onto a carina in the target are to prevent distal or incorrect placement. Once appropriately positioned, the valve is fully deployed. Further valves are placed in order to achieve complete occlusion of the target lobe. Placement of the IBV is similar but requires accurate airway sizing with a calibrated balloon catheter. Treatment has been complicated by exacerbations and some pneumothoraces but is generally safe. In the randomised study there were eight deaths (2.7%) and the incidence of other key adverse events was distal pneumonia (0.5%), pneumothorax requiring an intercostal drain for >7 days (1.4%) and respiratory failure (1.8%).118 There have been small improvements in lung function and variable improvements in quality of life depending on treatment strategy. The randomised study with Zephyr valves118 has shown only modest improvements in FEV1 of about 5.8%. There were no consistent improvements in the 6 min walk test and quality of life measures. The open-label study with the IBV demonstrated improvements in quality of life but no significant change in pulmonary function.119 However, the changes in subjective measures such as quality of life in an open-label study should be interpreted with caution. The place of endobronchial valves in patients with emphysema remains to be established. A number of bronchoscopic procedures are being developed for emphysema that include airway stents (bypass procedure) in homogeneous emphysema, coils which lead to infolding of the lung, hydrofoam gel and steam instillation to induce localised fibrosis. The prevalence of asthma is increasing and ranges from 10% to 13% in the UK. It is associated with a high admission rate of around 200 per 100 000 of the population per annum, and approximately 18% of patients in the UK have severe persistent asthma. Some symptoms are due to airflow obstruction as a direct result of airway smooth muscle contraction. Airway smooth muscle may also have a role in the pathogenesis of asthma by secreting proinflammatory cytokines and promoting airway remodelling. The goal of bronchial thermoplasty is to reduce airway smooth muscle. The treatment is performed via flexible bronchoscopy under conscious sedation. Microwave energy is delivered to the bronchial wall via a flexible catheter from a radiofrequency generator. The treatment catheter is passed through the bronchoscope and is navigated to the distal target airway. A wire array at the distal end of the catheter is expanded and the radiofrequency generator activated. This heats the airway wall to about 65°C and selectively ablates the concentric smooth muscle. The airways are treated in a systematic manner from distal to proximal. The right lower lobe is treated first followed by the left lower lobe 3 weeks later, then the upper lobes. Thermoplasty may be indicated in patients with severe persistent asthma receiving high-dose combination inhalers (>1000 μg beclometasone equivalent) plus long-acting bronchodilators or long-term oral corticosteroids. The FEV1 should be >50% predicted. Patients may experience post-procedure respiratory exacerbations. Limited long-term safety data for this procedure are available. However, despite some evidence for the use of thermoplasty in asthma, the studies are selective and the outcomes are only positive in some aspects. This is a treatment which might be useful for some selected cases of difficult asthma. The final place of thermoplasty in cases of difficult asthma remains to be established. This guideline provides an evidence-based overview of advanced diagnostic and therapeutic techniques, some of which are widely available and some of which are only available in specialist centres. It is clear that TBNA and EBUS are becoming standard practice in all regions. Tumour ablation is not routinely available via flexible bronchoscopy in all regions, and there are insufficient trainees who feel competent to undertake these procedures at the end of their training. There is therefore a need to identify those centres which provide hands-on training and to increase the availability of that training. In this rapidly developing field, new techniques and more evidence are going to become available so it is planned to review this guideline in 2015. There is also a need provide the evidence for patients, other practitioners and commissioners of the benefits of these techniques in the UK, so it will be important for centres using advanced bronchoscopy techniques to keep careful records and undertake audit. Not all techniques described here will be used in all centres or even every region. Some centres may continue, for example, to refer all patients for stenting or tumour ablation to surgical units. However, there is a need for all practitioners to be aware of what is available and to know when to consider referring patients for procedures they do not undertake themselves. Chairman of the British Thoracic Society Interventional Bronchoscopy Guideline Group. Professor Lewis has been in receipt of loan and prototype equipment from Olympus Ltd. Professor Lewis has no financial interest in Olympus Ltd. He is a faculty member of an interventional bronchoscopy course that is sponsored by Olympus, Erbe, Cook Medical, Superdimension, Taewoong medical, Alveolus & Emphaysis. Prof Lewis has no financial interest in any of these companies and there is no conflict of interest in relation to the guideline. Dr Barber has used diode laser equipment loaned by Axcan Ltd. He has no financial interest in Axcan Ltd.
Dr M Munavvar has been involved in prototype evaluation of interventional bronchoscopy/thoracoscopy related equipment for Olympus, Boston Scientific, Cook and Spiration. He organises Interventional Bronchoscopy/Thoracoscopy and Basic Bronchoscopy courses, which are sponsored by numerous companies including Olympus, ERBE, Wolf, Sonosite, Rocket, UK Medical, Nucleotron, Pentax, Fujinon, Conmed, Cook, Spiration and others. Dr Munavvar has no financial interest in any of these companies and there is no conflict of interest in relation to the guidelines. Dr Rintoul is in receipt of loan equipment from Olympus Ltd and Hitachi Pentax and Papworth Hospital acts as a reference centre for the technique of EBUS-TBNA. Olympus Ltd has provided educational grants to support courses about EBUS. Dr Rintoul has no financial interest in either Olympus Ltd or Hitachi Pentax. Dr PL Shah is a principle investigator for a number of clinical trials and the host institutions for the trials (Royal Brompton Hospital and the Chelsea & Westminster Hospital have been reimbursed for clinical trial expenses by Asthmatx, Boehringer Ingelheim, Broncus, Olympus & PneumRx. He is the course director for an interventional bronchoscopy course which has been sponsored by Olympus, Erbe, Cook Medical, Superdimension, Taewoong medical, Alveolus & Emphaysis. Dr Shah has no financial interest in any commercial entity whose interests are in any way connected with this guideline. Dr S Singh is a co investigator for interventional bronchoscopy trials in bronchial thermoplasty and lung coils. He is a faculty member of an interventional bronchoscopy course that is, sponsored by Olympus, Erbe, Cook Medical, Superdimension, Taewoong medical, Alveolus & Emphaysis. He has previously received Speaker fees from Cook Medical. Dr Singh has no financial interest in any company associated with this guideline. Dr Slade is clinical director of thoracic services at Papworth Hospital, which is or has been in receipt of loan equipment from Olympus UK Ltd and Hitachi Medical Ltd. Olympus UK, Pentax UK, Boston Scientific UK, Erbe Medical UK, Richard Wolf UK and Storz UK have sponsored educational courses on interventional pulmonology run by Dr Slade in Oxford and Cambridge. Dr Slade has no financial interest in any commercial entity whose interests are in any way connected with this guideline. Nicholas Smith BA(Hons) MsC, Information Support Librarian. Emma Gibbs, Senior Library Assistant. Rowlands Library, Worcestershire Royal Hospital. TBNA requires very few additional resources to implement, and is therefore readily available to all practitioners. Bronchoscopists have, however, frequently found that ‘real-world’ results do not equal those in the published literature. This guide is intended to help shorten the learning curve. (i) Familiarity with the needle for both the bronchoscopist and the assisting staff. (ii) Collaboration with colleagues in cytopathology to ensure optimal specimen preparation. (iii) Careful pre-procedure discussion with a radiologist to ensure that the bronchoscopist knows where the targets are endobronchially. There are several different TBNA needles available and choice between them is clearly a matter of personal preference and cost. It is recommended that demonstration needles are obtained of different types. Needles with a clear plastic outer sheath have the advantage that the aspirated material can be viewed during sampling, which helps the operator to know that the sample will be adequate. The whole team should practise with the chosen needle so that everyone knows what instructions will be given for advancing and retracting the needle, how and when to apply and release suction, and so on. There are a number of courses available on advanced techniques in bronchoscopy, which offer hands-on training in TBNA technique. It is strongly recommended that a new operator attends such a course, ideally together with bronchoscopy assisting staff. (i) The procedure described is for lymph node sampling. TBNA can also be used to sample extrabronchial tumour, or to take specimens from deep within necrotic lesions. (ii) Target lymph nodes are identified from prior CT or PET scanning. If the procedure is being performed for lung cancer staging, a plan is made to sample the highest-station nodes first (i.e., N3 before N2 before N1). (iii) The bronchoscopy is begun as usual. Once the bronchoscope is within the trachea, lymph node sampling is performed before any other inspection or sampling. If possible suctioning within the airways is avoided, lest any exfoliated malignant cells enter the working channel and contaminate the TBNA sample. If the view is obscured by mucus or blood, the injection of a small quantity of saline is used to clear the optic. (iv) The bronchoscope is positioned over the first target site, and the needle sheath advanced through the working channel. Approximately 5 mm of needle sheath is allowed to protrude from the distal end of the channel. (v) The bronchoscope is flexed so that the tip of the needle sheath lies against the airway wall, between the cartilaginous rings, and directed towards the target. (vi) The needle sheath is anchored within the working channel by one of two methods: operators with large hands may be able to use the little finger to apply gentle pressure to the sheath against the wall of the working channel, while still directing the bronchoscope. Others may prefer to ask an assistant to anchor the needle sheath. An advantage for the operator of anchoring the needle oneself is that subtle tactile feedback occurs as the sheath tip moves up and down the airway, ‘bumping over’ the cartilage rings. This may facilitate precise, correct positioning of the sheath tip between the rings. (vii) The assistant is then asked to advance the needle, using some agreed instruction (eg, ‘needle out’). If the needle is of a type that has a reasonably stiff wire running down it, and if the tip of the sheath is correctly positioned between the airway cartilages, the needle will often pass directly through the airway wall. This is known as the ‘Hub against the wall’ method. If the needle does not penetrate the airway and instead causes the sheath and bronchoscope to recoil, the operator can advance the bronchoscope, with the needle sheath still anchored within the working channel, to attempt penetration with the ‘Piggy back’ method. (viii) Once the needle has passed through the airway wall, it may be necessary to advance the needle sheath, while carefully withdrawing the bronchoscope, so that more of the needle sheath is visible before sampling begins. Otherwise, as the needle sheath is drawn back to begin the cycle of to-and-fro motion through the lymph node, the airway wall may simple recoil forwards towards the bronchoscope, obscuring the view, before any relative motion between the needle and the lymph node has occurred. (ix) The bronchoscopist then asks that suction be applied to the needle. (x) The bronchoscopist then begins to-and-fro motion of the needle sheath, and observes carefully the motion of the needle as it enters the airway wall. It is important to be able to observe definite motion in and out, though care should be taken not to withdraw the needle completely from the airway wall. This takes considerable practice. (xi) During the sampling process it is helpful if an assistant holds the bronchoscope stationary at the nose or mouth. (xii) With some experience it is possible for the operator to know whether a lymph node is being successfully sampled. If it is, then gooey material, looking a little like pink toothpaste or raspberry ripple ice-cream, is seen entering the needle sheath. If the needle appears to be well-positioned, and satisfactory passes are being performed, but no such aspirate is obtained, it is worth slowly withdrawing the needle and then advancing it rapidly in a jabbing motion. This is because some lymph nodes have a relatively tough capsule that deforms steadily as the needle is advanced, without permitting penetration. A jabbing action can overcome this effect and allow the needle to enter the node, which then yields “goo” as above. (xiii) Once a satisfactory specimen is obtained, the needle is withdrawn by the assistant, in response to a clear and previously agreed instruction from the operator. The needle sheath is withdrawn and the specimen prepared by the assistant. (xiv) The way that specimens are prepared will depend upon the preference of the local cytopathologist. The options are direct smears, air-dried or fixed with cytological fixative, or both; or simple flushing of the sample into liquid, which may be either saline, cytological fixative or media suitable for RNA extraction or flow cytometry. The best results, in the author's experience, are always obtained by giving the cytopathology department what it wants. (xv) Further samples are then taken from the same lymph node station, before moving on to further, lower-stage sites. It is recommended that up to 5 passes are obtained through each node. There are a few rules that will help to avoid complications and promote success. (i) The needle should never be advanced unless the tip of its sheath is clearly visible, otherwise the needle may perforate the working channel. (ii) Always sample the highest-station nodes first. (iii) Don't give up if the first few nodes sampled give non-diagnostic results. The learning curve for TBNA is not flat. (iv) Aim for large (>2 cm short axis) nodes for your first few procedures. Effective palliative measure for endobronchial airway obstruction. Initial hyperaemia of tumour, with temporary increase in airway obstruction. Not well established as a flexible bronchoscopy technique; poorly tolerated with conscious sedation.
. Brave new world for interventional bronchoscopy. Thorax 2005;60:180–1.
. BTS bronchoscopy training survey 2009. Thorax 2009;64:A159–66. ; American College of Chest Physicians. Interventional pulmonary procedures: guidelines from the American College of Chest Physicians. Chest 2003;123:1693–717. ; European Respiratory Society/American Thoracic Society. ERS/ATS statement on interventional pulmonology. European Respiratory Society/American Thoracic Society. Eur Respir J 2002;19:356–73.
. Learning curves for endobronchial ultrasound using cusum analysis. Thorax 2010;65:534–8.
. Endoscopic and endobronchial ultrasonography according to the proposed lymph node map definition in the seventh edition of the tumor, node, metastasis classification for lung cancer. J Thorac Oncol 2009;4:1576–84.
. Accuracy of transbronchial needle aspiration for mediastinal staging of non-small cell lung cancer: a meta-analysis. Thorax 2005;60:949–55. ; American College of Chest Physicians. Invasive mediastinal staging of lung cancer: ACCP evidence-based clinical practice guidelines (2nd edition). Chest 2007;132(3 Suppl):202S–20S.
. Transbronchial needle aspirates: how many passes per target site? Eur Respir J 2007;29:112–16.
. Transbronchial needle aspiration in diagnosing and staging lung cancer: how many aspirates are needed? Am J Respir Crit Care Med 2002;166:377–81.
. Combining transbronchial aspiration with endobronchial and transbronchial biopsy in sarcoidosis. Monaldi Arch Chest Dis 1999;54:217–23.
. Transbronchial needle aspiration in sarcoidosis: yield and predictors of a positive aspirate. J Thorac Cardiovasc Surg 2008;135:837–42.
. Effectiveness and safety of endobronchial ultrasound-transbronchial needle aspiration: a systematic review. Eur Respir J 2009;33:1156–64.
. Invasive staging of non-small cell lung cancer: a review of the current evidence. Chest 2003;123(1 Suppl):157S–66S.
. EBUS-TBNA for the diagnosis of central parenchymal lung lesions not visible at routine bronchoscopy. Lung Cancer 2009;63:45–9.
. Endobronchial ultrasound-guided transbronchial needle aspiration for the diagnosis of intrapulmonary lesions. J Thorac Oncol 2008;3:985–8.
. Endobronchial ultrasound-guided transbronchial needle aspiration in the diagnosis of lymphoma. Thorax 2008;63:360–5.
. Endobronchial ultrasound: new insight for the diagnosis of sarcoidosis. Eur Respir J 2007;29:1182–6.
. Real-time endobronchial ultrasound-guided transbronchial needle aspiration is useful for diagnosing sarcoidosis. Respirology 2007;12:863–8.
. Endobronchial ultrasound for the diagnosis of pulmonary sarcoidosis. Chest 2007;132:1298–304.
. The value of endoscopic ultrasound after bronchoscopy to diagnose thoracic sarcoidosis. Eur Respir J 2010;35:1329–35.
. Endoscopic treatment of malignant airway obstructions in 2008 patients. Chest 1996;110:1536–42.
. Endobronchial electrocautery and argon plasma coagulation. In: Progress in Respiratory Research. Basel: Karger, 2000:120–32.
. Radiographically occult lung cancer treated with fibreoptic bronchoscopic electrocautery: a pilot study of a simple and inexpensive technique. Eur Respir J 1998;11:169–72.
. Management of benign stenoses of the large airways in the university hospital in Prague, Czech Republic, in 1998–2003. Respiration 2005;72:622–8.
. Endobronchial electrocautery is an excellent alternative for Nd:YAG laser to treat airway tumors. J Bronchol 1997;4:101–5.
. Endobronchial electrocautery. Chest 1985;87:712–14.
. Endobronchial electrocautery. Chest 1988;94:595–8.
. Flooding with carbon dioxide prevents airway fire induced by diathermy during open tracheostomy. J Trauma 2007;63:228–31.
. Safety study of endobronchial electrosurgery for tracheobronchial lesions: multicenter prospective study. J Bronchol 2008;15:228–32. Medicines and Healthcare products Regulatory Agency (MHRA). Guidelines for the Perioperative Management of Patients with Implantable Pacemakers or Implantable Cardioverter Defibrillators, where the use of Surgical Diathermy/Electrocautery is Anticipated, 2006. http://www.mhra.gov.uk/home/groups/dts-bi/documents/websiteresources/con2023451.pdf (accessed 13 Feb 2010).
. Fibreoptic bronchoscopic electrosurgery under local anaesthesia for rapid palliation in patients with central airway malignancies: a preliminary report. Thorax 1994;49:1243–6.
. [Treatment of bronchial tumors with high-frequency thermocoagulation. Preliminary studies] (In French). Rev Pneumol Clin 1995;51:77–81.
. Endobronchial electrosurgery. Chest 1988;93:270–4.
. Use of endobronchial electrocautery for the palliation of airway obstruction due to metastases from nonpulmonary malignancies. J Bronchol 2006;13:124–7.
. Endobronchial argon plasma coagulation for treatment of hemoptysis and neoplastic airway obstruction. Chest 2001;119:781–7.
. Argon plasma coagulation in bronchology: a new method—alternative or complementary? J Bronchol 2000;7:109–17.
. Endoscopic surgery with a flexible bronchoscope and argon plasma coagulation for tracheobronchial tumors. J Thorac Cardiovasc Surg 2001;121:180–2.
. Endoscopic argon plasma coagulation for palliative treatment of malignant airway obstructions: early results in 47 cases. Lung Cancer 2001;33:75–80.
. The use of endoscopic argon plasma coagulation in airway complications after solid organ transplantation. Chest 2001;119:1968–75.
. Gas embolism following bronchoscopic argon plasma coagulation: a case series. Chest 2008;134:1066–9.
. Nd:YAG laser bronchoscopy. A five-year experience with 1,396 applications in 1,000 patients. Chest 1988;94:15–21.
. A two-year experience with the neodymium-YAG laser in endobronchial obstruction. Chest 1987;91:159–65.
. Experiences with laser bronchoscopy. Pa Med 1991;94:24–7.
. Laser therapy in 100 tracheobronchial tumours. Thorax 1985;40:341–5.
. Photodynamic therapy, Nd-YAG laser and electrocautery for treating early-stage intraluminal cancer: which to choose? Lung Cancer 2001;31:31–6.
. Treatment of tracheobronchial lesions by laser photoresection. Chest 1982;81:278–84.
. One hundred neodymium-YAG laser ablations of obstructing tracheal neoplasms. Ann Thorac Surg 1984;38:374–81.
. Endobronchial Nd:YAG laser surgery. J Ky Med Assoc 1989;87:227–9.
. Nd:YAG laser bronchoscopy. Rigid or fiberoptic mode? Chest 1990;98:271–5.
. Endoscopic laser therapy for obstructing tracheobronchial lesions. Ann Otol Rhinol Laryngol 1991;100:413–19.
. The heat is on: impact of endobronchial electrosurgery on the need for Nd-YAG laser photoresection. Chest 2000;118:516–21.
. Nd-YAG laser vs bronchoscopic electrocautery for palliation of symptomatic airway obstruction: a cost-effectiveness study. Chest 1999;116:1108–12.
. Bronchoscopic cryotherapy for airway strictures caused by tumors. Chest 1986;90:159–64.
. The application of cryosurgery in the treatment of lung cancer. Cryobiology 2004;48:55–61.
. Cryosurgery for malignant endobronchial tumors: analysis of outcome. Chest 2005;127:2007–14.
. Cryosurgery in bronchoscopic treatment of tracheobronchial stenosis. Indications, limits, personal experience. Chest 1993;103:472–4.
. Cryotherapy for advanced carcinoma of the trachea and bronchi. BMJ (Clin Res Ed) 1986;293:181–2.
. Fiberoptic bronchoscopic cryotherapy in the management of tracheobronchial obstruction. Chest 1996;110:718–23.
. Initial combined cryotherapy and irradiation for unresectable non-small cell lung cancer; preliminary results. Chest 1992;102:1436–40.
. Cryorecanalization: a new approach for the immediate management of acute airway obstruction. J Thorac Cardiovasc Surg 2004;127:1427–31.
. Successful immediate cryorecanalization of a simultaneous high-grade tracheal and bronchial stenosis as rare manifestations of bronchial-associated lymphoid tissue lymphoma. J Thorac Cardiovasc Surg 2009;137:e17–19.
. Challenging manifestations of malignancies: Case 3. Fibrinous tracheitis: an uncommon manifestation of Hodgkin's lymphoma. J Clin Oncol 2004;22:3642–3.
. Transbronchial cryobiopsy: a new tool for lung biopsies. Respiration 2009;78:203–8.
. The application of photodynamic therapy in the treatment of metastatic endobronchial disease. Lasers Surg Med 2006;38:376–83.
. Photodynamic therapy (PDT) in early central lung cancer: a treatment option for patients ineligible for surgical resection. Thorax 2007;62:391–5.
. Photodynamic therapy in the management of early superficial squamous cell carcinoma as an alternative to surgical resection. Chest 1992;102:1319–22.
. Photodynamic therapy for lung cancers based on novel photodynamic diagnosis using talaporfin sodium (NPe6) and autofluorescence bronchoscopy. Lung Cancer 2007;58:317–23.
. The place of bronchoscopic photodynamic therapy in advanced unresectable lung cancer: experience of 100 cases. Eur J Cardiothorac Surg 1999;15:1–6.
. Is bronchoscopic photodynamic therapy a therapeutic option in lung cancer? Eur Respir J 2003;22:535–41.
. Efficacy and safety of photodynamic therapy versus Nd-YAG laser resection in NSCLC with airway obstruction. Eur Respir J 1999;14:800–5.
. High dose rate endobronchial brachytherapy in the management of lung cancer: response and toxicity evaluation in 158 patients. Lung Cancer 2008;62:326–33.
. High-dose-rate endobronchial brachytherapy effectively palliates symptoms due to airway tumors: the 10-year M. D. Anderson cancer center experience. Int J Radiat Oncol Biol Phys 2000;48:697–702.
. Massive haemoptysis death and other morbidity associated with high dose rate intraluminal radiotherapy for carcinoma of the bronchus. Radiother Oncol 1996;39:105–16.
. High dose rate endobronchial brachytherapy in combination with external beam radiotherapy for stage III non-small cell lung cancer. Lung Cancer 2001;34:253–9.
. Endobronchial brachytherapy and external-beam radiotherapy in patients with endobronchial obstruction and extrabronchial extension. Brachytherapy 2002;1:204–10.
. High dose rate brachytherapy for the local control of endobronchial carcinoma following external irradiation. Thorax 1996;51:354–8.
. Low dose rate versus high dose rate intraluminal brachytherapy for malignant endobronchial tumors. Radiother Oncol 1995;35:193–7.
. IR-192, low dose rate endobronchial brachytherapy in the treatment of malignant airway obstruction. Int J Radiat Oncol Biol Phys 1993;27:677–80.
. Clinical and quality of life outcomes in the first United Kingdom randomized trial of endobronchial brachytherapy (intraluminal radiotherapy) vs external beam radiotherapy in the palliative treatment of inoperable non-small cell lung cancer. Radiother Oncol 2000;56:323–7.
. External irradiation and intraluminal irradiation using middle-dose-rate iridium in patients with roentgenographically occult lung cancer. Int J Radiat Oncol Biol Phys 2001;49:965–71.
. T-tube tracheal stent. Arch Otolaryngol 1965;82:320–1.
. A dedicated tracheobronchial stent. Chest 1990;97:328–32.
. Medium-term follow-up after deployment of ultraflex expandable metallic stents to manage endobronchial pathology. Ann Thorac Surg 2004;78:1898–902.
. Bronchial stents. Ann Thorac Med 2006;1:92–7.
. Flexible bronchoscopy: a safe method for metal stent implantation in bronchial disease. Ann Thorac Surg 2000;69:398–401.
. The use of the covered Wallstent for the palliative treatment of inoperable tracheobronchial cancers. A prospective, multicenter study. Chest 1996;110:1161–8.
. Do airway metallic stents for benign lesions confer too costly a benefit? BMC Pulm Med 2008;8:7.
. Refractory post-transplant airway strictures: successful management with wire stents. Eur J Cardiothorac Surg 1999;15:842–50.
. Implantation of Ultraflex nitinol stents in malignant tracheobronchial stenoses. Chest 2000;118:959–65.
. Self-expandable metallic tracheobronchial stent insertion and endobronchial electrocautery with flexible bronchoscopy: preliminary results at a cancer center. J Formos Med Assoc 2002;101:399–405.
. Metallic stent and flexible bronchoscopy without fluoroscopy for acute respiratory failure. Eur Respir J 2008;31:1019–23.
. Self-expandable metallic airway stent insertion employing flexible bronchoscopy: preliminary results. Chest 1998;114:106–9.
. Electromagnetic navigation diagnostic bronchoscopy: a prospective study. Am J Respir Crit Care Med 2006;174:982–9.
. Electromagnetic navigation diagnostic bronchoscopy in peripheral lung lesions. Chest 2007;131:1800–5.
. Electromagnetic navigation diagnostic bronchoscopy and transbronchial biopsy. Chest 2008;133:829–30.
. Diagnostic accuracy and safety of CT-guided percutaneous needle aspiration biopsy of the lung: comparison of small and large pulmonary nodules. AJR Am J Roentgenol 1996;167:105–9.
. Pneumothoraces and chest tube placement after CT-guided transthoracic lung biopsy using a coaxial technique: incidence and risk factors. AJR Am J Roentgenol 1999;172:1049–53.
. Variables affecting the risk of pneumothorax and intrapulmonal hemorrhage in CT-guided transthoracic biopsy. Eur Radiol 2008;18:1356–63.
. Real-time electromagnetic navigation bronchoscopy to peripheral lung lesions using overlaid CT images: the first human study. Chest 2006;129:988–94.
. Electromagnetic navigation bronchoscopy in combination with PET-CT and rapid on-site cytopathologic examination for diagnosis of peripheral lung lesions. Lung 2009;187:55–9.
. Accuracy and feasibility of electromagnetic navigated bronchoscopy under nitrous oxide sedation for pulmonary peripheral opacities: an outpatient study. Respiration 2009;78:293–300.
. Multimodality bronchoscopic diagnosis of peripheral lung lesions: a randomized controlled trial. Am J Respir Crit Care Med 2007;176:36–41.
. Comparison of suction catheter versus forceps biopsy for sampling of solitary pulmonary nodules guided by electromagnetic navigational bronchoscopy. Respiration 2010;79:54–60.
. A virtual bronchoscopic navigation system for pulmonary peripheral lesions. Chest 2006;130:559–66.
. A virtual bronchoscopic navigation system under x-ray fluoroscopy for transbronchial diagnosis of small peripheral pulmonary lesions. Lung Cancer 2007;57:322–7.
. Factors related to diagnostic sensitivity using an ultrathin bronchoscope under CT guidance. Chest 2007;131:549–53.
. Early results of endoscopic lung volume reduction for emphysema. J Thorac Cardiovasc Surg 2004;127:1564–73.
. Bronchoscopic lung volume reduction for end-stage emphysema: report on the first 98 patients. Chest 2006;129:518–26.
. Effect of bronchoscopic lung volume reduction on dynamic hyperinflation and exercise in emphysema. Am J Respir Crit Care Med 2005;171:453–60.
. Bronchoscopic lung-volume reduction with one-way valves in patients with heterogenous emphysema. Ann Thorac Surg 2005;79:411–17.
. Bronchoscopic volume reduction with valve implants in patients with severe emphysema. Lancet 2003;361:931–3.
. MDCT assessment of lung volume in patients undergoing bronchial stenting for treatment of pulmonary emphysema: correlation with respiratory tests and personal experience (In Italian). Radiol Med 2006;111:749–58.
. Transbronchoscopic pulmonary emphysema treatment: 1-month to 24-month endoscopic follow-up. Chest 2006;130:190–9. ; VENT Study Research Group. A randomized study of endobronchial valves for advanced emphysema. N Engl J Med 2010;363:1233–44.
. A multicenter trial of an intrabronchial valve for treatment of severe emphysema. J Thorac Cardiovasc Surg 2007;133:65–73.e2.
. Computed tomography assessment of lung volume changes after bronchial valve treatment. Eur Respir J 2008;32:1443–50.
. A prospective feasibility study of bronchial thermoplasty in the human airway. Chest 2005;127:1999–2006.
. Bronchial thermoplasty for asthma. Am J Respir Crit Care Med 2006;173:965–9. ; AIR Trial Study Group. Asthma control during the year after bronchial thermoplasty. N Engl J Med 2007;356:1327–37.
. Safety and efficacy of bronchial thermoplasty in symptomatic, severe asthma. Am J Respir Crit Care Med 2007;176:1185–91. ; AIR2 Trial Study Group. Effectiveness and safety of bronchial thermoplasty in the treatment of severe asthma: a multicenter, randomized, double-blind, sham-controlled clinical trial. Am J Respir Crit Care Med 2010;181:116–24.
. State of the art: interventional pulmonology. Chest 2007;131:261–74.
. High dose rate endobronchial brachytherapy effectively palliates symptoms due to inoperable lung cancer. Jpn J Clin Oncol 2002;32:443–8.
. Bronchoscopic cryotherapy for advanced bronchial carcinoma. Thorax 1990;45:509–13.
. Cryotherapy for tracheobronchial disorders. Clin Chest Med 1995;16:427–43.
. Nd:YAG laser resection of lung cancer invading the airway as a bridge to surgery and palliative treatment. Ann Thorac Surg 2002;74:995–8.
. Bronchoscopic diathermy resection and stent insertion: a cost effective treatment for tracheobronchial obstruction. Thorax 1993;48:1156–9. Membership of the Committee with their conflicts of interest are shown in Appendix 1 and a list of stakeholders is given in Appendix 5. Provenance and peer review Not commissioned; internal and external peer review undertaken by the Standards of Care Committee of the British Thoracic Society.